Thanks for all your kind words and thoughts after my extraction last weekend! It took me a week, but I'm finally back to normal now. I'm excited to head back to my hometown, Chicago, for a few days this week. I don't do much travel for work (4-5 trips a year), but two of those trips are coming up in the next two weeks, so I'm going to be a busy bee! I really enjoy traveling. Don't always enjoy the working part, but I generally get to see family, friends, or new places. And it's a nice break from the office routine. 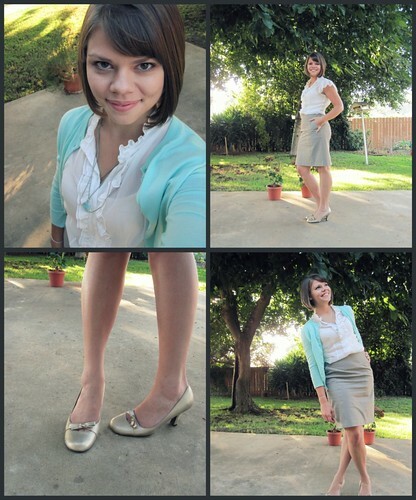 Last week I took a couple pictures of my work outfit for the day--it was a little more frilly than usual. The lighting was just perfect and I couldn't resist. Thank you camera timer! ps. check out our great back yard! i have some potted herbs on the patio and love the big shady tree. How cute are you?! And I just love that outfit! Ahhh! You are so stinking adorable! I LOVE that outfit! You and I have very similar tastes. Wish we lived closer and could share closets! And thanks for the Kendi blog - I'm always looking for good fashion inspiration blogs. That is such a cute outfit! I love the ruffly top! Wow, I'm pretty much dying over the color of that cardigan. Gorgeous!